The troops of 12 Assam Rifles recovered seven gold bars while checking a Maruti Van travelling from Moreh to Imphal at Permanent Vehicle Check Post (PVCP) at Khudengthabi around 1.30 pm on Saturday. The Permanent Vehicle Check Post of the Assam Rifles at Khudengthabi is located about 100 km south of Imphal along the 110 km Imphal-Moreh sector of the National Highway. Many illegal items of foreign origin are recovered and seized every week or so at this checking point which connects with Moreh, an important commercial border under Tengnoupal district bordering Myanmar. 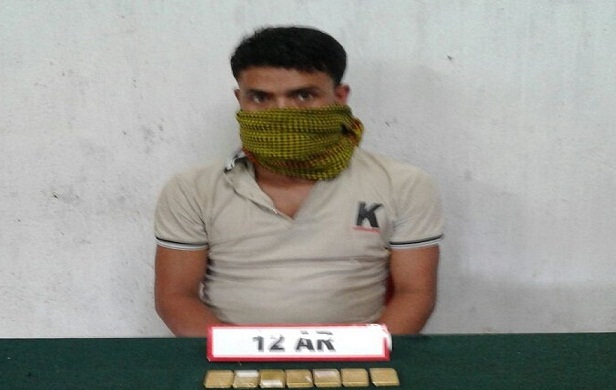 The driver aged around 32 years is a resident of Thoubal district and was handed over to Customs Preventive Force at Moreh along with the recovered gold bars. The PRO Assam Rifles (South) when contacted said they are not disclosing the identity of the driver as further investigation is on. Earlier the same troops of 12 Assam Rifles apprehended two illegal immigrants along with 7.5 lakhs Kyat (Rs 38000/- approximately in Indian currency) and a local handler at PVCP at Khudengthabi on Friday.